Met data includes wind, surface pressure, 500 mb height, precipitation, cloud cover, lifted index, CAPE, air temperature and waves. Ocean data includes ocean currents, sea surface temperature, sea surface height, sea surface salinity, mixed layerr depth and chlorophyll. Unlimited GRIB Met plans include unlimited access to wind, wave, surface pressure, 500 mb height, precipitation, cloud cover, lifted index, CAPE, and air temperature. Downloads of Class 10 ocean products are not included in your Unlimited GRIB Met plan and will be charged separately at $5 per piece downloaded. Unlimited GRIB Met and Ocean data plans include all Met data (see above) as well as ocean currents, sea surface temperature, sea surface height, sea surface salinity, mixed layerr depth and chlorophyll. OCENS’ announced its entrance into the mobile app space with the introduction of GRIB Explorer Plus GRIB file viewer for the iPad. 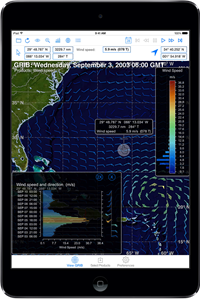 GRIB Explorer Plus merges the unparalleled weather, ocean and fishing data processing power of its PC and Mac versions with the dexterity of the iPad platform. GRIB Explorer Plus uses any Wi-Fi connection, including Wi-Fi enabled satellite phones, to access and download GRIB data files anywhere in the world from the all-encompassing OCENS Everon weather servers. 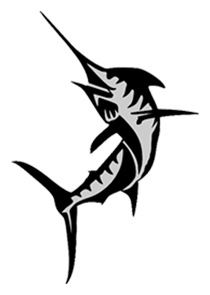 The OCENS Everon servers house the most robust and easy-to-use GRIB weather, ocean and fishing data library in the world. Just some of the available GRIB file content includes ocean and global winds, waves, ocean currents, surface pressure, temperature, precipitation, cloud cover, lifted index and 500 mb levels. Extensive sets of high resolution sea surface temperature, sea surface height, salinity, chlorophyll and mixed layer depth are available for recreational, big game and commercial fishers. Multiple model sources are available for most content types. The entire service is configured so that information can be easily selected and rapidly returned to you within one quick and simple data session. No need to hunt the Internet to find the GRIB data files you need. To retrieve Everon content using GRIB Explorer Plus, users select the GRIB products, forecast period and region of interest to them in GRIB Explorer’s offline data library. GRIB Explorer then reaches out via Wi-Fi, Wi-Fi-integrated satellite phones (Iridium GO!, Hughes and AddValue BGANS as well as those using our Sidekick Wi-Fi router) and quickly retrieves those data before displaying the information in stunning detail on the iPad. The unique analytical tools which have made GRIB Explorer the definitive GRIB processing software on the PC and Mac are then deployed to extract system, mission and even life-critical information from these data. If you are connecting through a Wi-Fi integrated or enabled satellite phone, GRIB Explorer Plus can auto-dial through the satellite phone to the appropriate satellite network.GRIB Explorer Plus connects in just seconds, then retrieves your weather, ocean and/or fishing data from the OCENS Everon servers. Just as important is GRIB Explorer Plus' capacity to auto-disconnect and terminate your satellite connection once the data is onboard your iPad. Easy and fast and cost-effective. GRIB Explorer Plus. 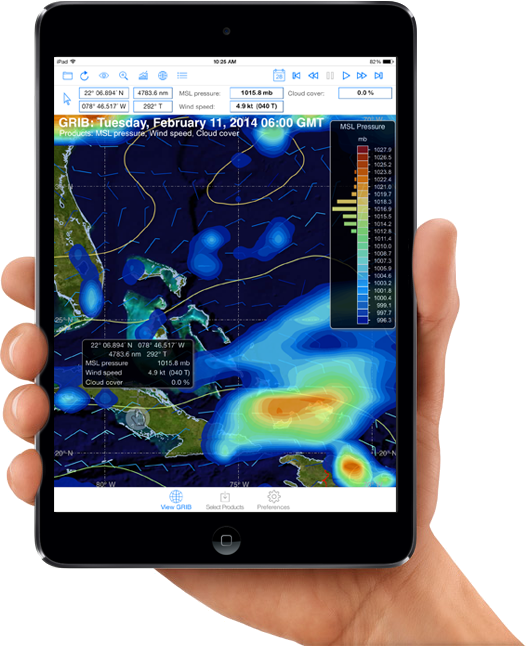 Unparalleled GRIB data access and analysis for the iPad. OCENS GRIB Explorer Plus melds GRIB weather and ocean data into sensational images carrying unparalleled insights into the environment around you. GRIB data is overlaid on fantastic earth imagery for any location in the world. Fingertip response reveals high accuracy latitude/longitude position, bearing and range from your "Home Location" to the point under study and, of course, the weather or ocean parameter value(s) at the subject point. GRIB Explorer’s Trip Planner displays the GRIB weather data along a route through time. Use Trip Planner to search for the best combination of weather conditions for your trip or to adjust departure dates or route according to forecast weather or ocean conditions that are revealed only with the very special tool. The Route Finder tool narrows your analysis to a single frame of data. Draw a route or transect across any portion of the GRIB frame in front of you. Route Finder responds by casting a 2D chart to show the changes in parameter value(s) along that line. Use it to changes which are stunningly obvious in Route Finder’s 2D graph that are less so across the whole field of the GRIB frame. Move your finger into the graph. The Route Finder chart displays the actual values of each parameter in the graph at that point AND relates them to their position on the transect by plotting a pointer on that transect. The pointer moves along the line as you move your finger within the Route Finder graph. The Time Profile tool tips the Route Finder on end and pulls insights from your GRIB data that are generally not easy to see without a great deal of effort and documentation. Instead of staring at a particular spot as you page through each frame of your GRIB, simply launch Time Profile and point to that spot on the current frame. Time Profile displays a chart of weather or ocean conditions at that point through all frames of the GRIB. Acquire a multi-frame, multi-day GRIB file, drop your finger pointer on a location and see a graph of precipitation totals at that point for each frame. Move your pointer around the screen and the Time Profile graph dynamically adjusts itself to your target and its underlying weather variables. GRIB Explorer Plus works with any GRIB data file that is formatted in a manner consistent with WMO GRIB1 standards, including those acquired via email or web sources. GRIB Explorer Plus is compatible with the OCENS Everon data service. Everon servers provide on-demand delivery of weather, ocean and fishing data from multiple GRIB data models for any location on land or sea. Meteorological data available from Everon includes wind direction and speed, surface pressure, precipitation, cloud cover, 500 mb height, lifted index and CAPE. Ocean data available from Everon includes wave height, direction and period, sea temperature, sea surface height, ocean currents, salinity and mixed layer depth. GRIB Explorer users working with Everon box the area of the world for which they are interested in obtaining data and specify the 1 through 7 day forecast, and the specific model or models they want to use as their source of data. Tapping the "Download" link accesses the Everon server, then retrieves, unpacks, processes, maps and displays the GRIB data in just seconds. Register for service by entering your preferred username and password above and selecting any prepaid amount you wish to add to your service*. 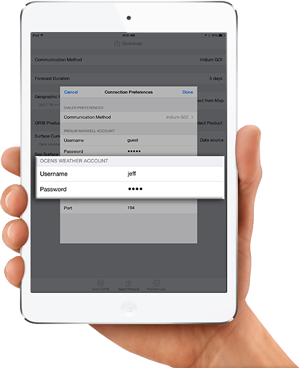 This will setup your account for all data downloads via your GRIB Explorer iPad app. Username and Password will be confirmed via email once your account has been activated. You will then need to enter this information into the setting in the GRIB Explorer iPad app. Met data includes wind, waves, surface pressure, 500 mb height, precipitation, cloud cover, lifted index, CAPE, and air temperature. Ocean data includes ocean currents, sea surface temperature, sea surface height, sea surface salinity, mixed layer depth and chlorophyll. Unlimited GRIB Met plans include unlimited access to wind, wave, surface pressure, 500 mb height, precipitation, cloud cover, lifted index, CAPE, and air temperature. *Downloads of Class 10 ocean products are NOT included in your Unlimited GRIB Met plan and will be charged separately at $5 per piece downloaded. Unlimited GRIB Met and Ocean data plans include all Met data (see above) as well as ocean currents, sea surface temperature, sea surface height, sea surface salinity, mixed layer depth and chlorophyll. Unlimited accounts auto-renew at a term of equal length to that of original registration unless OCENS is otherwise notified by user. Multiple auto-renewal reminders are sent prior to auto-renewal.